In addition to generating energy, over the course of its lifetime, the massive solar array now adorning the hangar roof at New Hampshire's Granite Jet Center will offset the same amount of carbon emissions as a car driving more than 11 million miles. 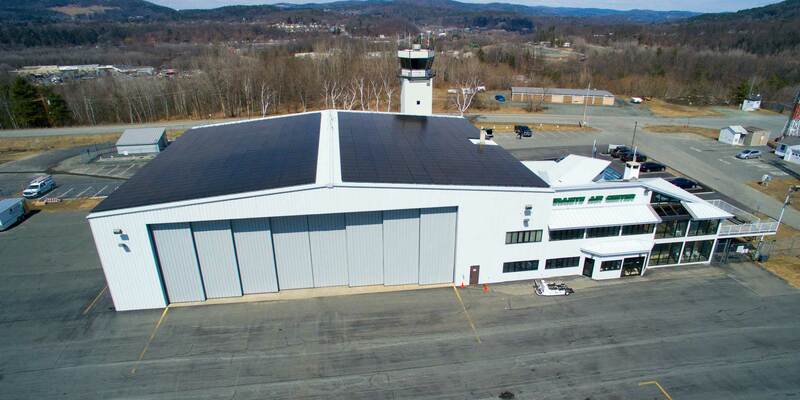 New Hampshire FBO Granite Air Center, the lone service provider at Lebanon Municipal Airport, has partnered with Norwich Solar Technologies in neighboring Vermont to install a solar array on the roof of its main hangar. The 218.1-kilowatt photovoltaic system, completed last month, is the largest such solar system in the city of Lebanon. The improvement is part of a recent uptick in solar projects at airports that can be credited to the FAA’s Airport Environmental Program, which is intended to reduce emissions while benefitting operators with significant savings in an industry with typically large operational and environmental costs. The abundance of roof space on hangars and terminals—as well as unobstructed, unshaded exposure—make airports particularly attractive venues for solar arrays. Over its 25-year lifespan, the FBO’s array will provide an environmental offset of more than 5.5 million pounds of CO2, the equivalent of burning 268,000 gallons of jet-A.